Florida and Georgia both came into the day with one job: win a game between two desperate rivals to right their respective ships. For all that Mike White’s team has done wrong this year, they were the team that got that job done. Just remember the 226th all time meeting between the Gators and Bulldogs as the World’s Largest Indoor Brick Party, and remember Florida as the team that teased its fan base with the pretense of NCAA Tournament hopes a little longer. Both teams shot under 40% from the floor, but the Gators dominated the final minutes for once and ended the game on a 19-4 run to survive, 62-52, in Athens. The first few minutes set the stage for an ugly afternoon. Florida managed eight points over the first six minutes of the game before Georgia could get on the board with a lone free throw, and from there, the game segued into a display of bad shot selection, Georgia turnovers and a sizeable Florida lead. Five different Gators hit a three in the first half, which helped build a 33-23 halftime lead. But Georgia came flying out of the gates to start the second half, scoring the first eight points before finally tying the score at 40 on a Teshaun Hightower three and then taking a 42-40 lead on an E’Torrion Wilridge putback. The two teams would go back and forth before Noah Locke finally gave Florida the lead for good with a three to make it 50-48 with 6:07 left to play. From there, Florida shut it down. Coming out of the under-four timeout with 3:37 to play, KeVaughn Allen broke underneath the basket, came around to the other side of the perimeter, picked up a screen, caught the pass from Andrew Nembhard and drained the corner three to put Florida up 55-48. Nicolas Claxton then brought Georgia back within five with a pair of free throws, but Allen came back with another jumper to return the margin to seven. Then the Gators then locked down defensively, nearly shutting Georgia out for the duration of the contest. By the time the Bulldogs did score again, on a Jordan Harris jumper, there were only 22 seconds left in a game Florida led 58-52. And with four free throws to ice it, the Gators could finally exhale. But while Florida was clearly the better team down the stretch today, it has proven multiple times to be the safe bet to not be the better team down the stretch in a given game. Today was a solid first step of a turnaround for a team that has, so far, done an excellent job losing games it should not. 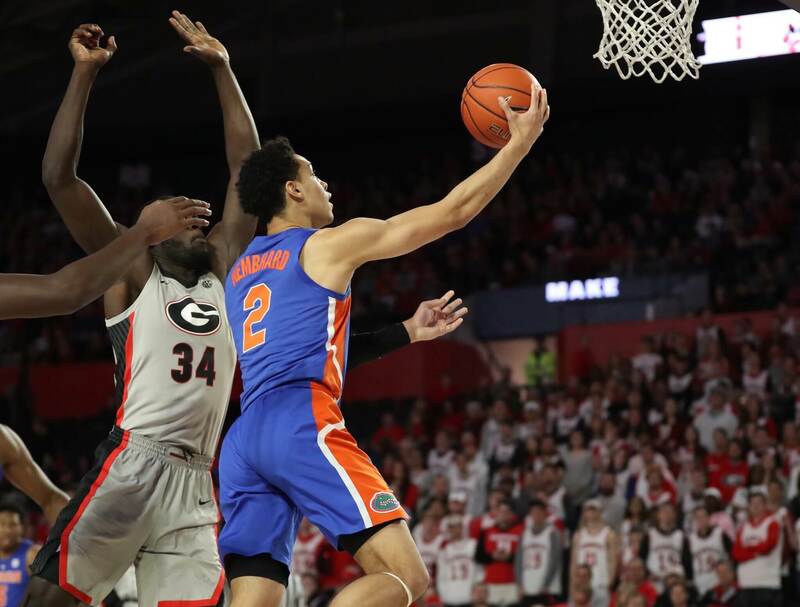 The Gators will have to be able to do this against teams far better than Georgia, though, and they’d be better suited to do so if they don’t have to rely on 20 turnovers and a 39.5% shooting night from their opponent. To boot, some of the shot selection from Florida today was as bad as it’s been all season. Nevertheless, it’s a win, and you’d always rather learn from a win than a loss. Particularly against Georgia.